I was diagnosed with Pre-b Acute Lymphoblastic Leukemia in March of 2017. I was in and out of the hospital over 135 days. While in the hospital, I was introduced to Smile-A-Mile through their Hospital Outreach Program. 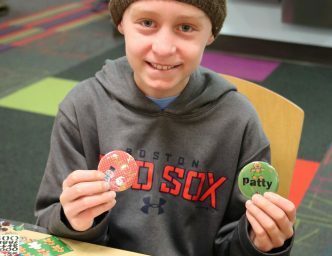 I looked forward to every Tuesday afternoon for SAM to come to the hospital with their fun activities. Mrs. Kellie and Ms. Madison make SAM so much fun I forget I have cancer. I did not get to go to camp last year because I was so sick, but I am so excited to go this Spring! I cannot wait!!! Thank you Smile-A-Mile for always making sure kids like me have something fun to do.